At some point in the last three years, Luna transitioned from a “reunion” to an actively recording and touring band. This year saw two new Luna releases, a full album of eclectic covers (A Sentimental Education) and an all-instrumental EP (A Place Of Greater Safety). For A Sentimental Education, the band placed their own unique stamp on an interesting selection of covers. It was the first new Luna album in 13 years and it hit all the right buttons — 70s and 80s influences and one 90s contemporary. The selection of songs are for the connoisseur, no obvious tracks to be found. The final night of Luna’s most recent tour reached Brooklyn Steel two Saturdays ago. This was the largest venue the band had played in NYC maybe ever, and a healthy crowd showed up in support. The band began the night with opening track from Greater Safety and proceeded to treat the fans to a nice selection of classic material mixed with the new versions of memorable tracks from Sentimental. Indeed the set ended with an inspired performance of Mercury Rev’s “Car Wash Hair” followed by a series of encores. On this night, the rarity was an infrequent appearance of the Galaxie 500 classic “Tugboat”. I recorded this set with the Neumann hypercards mounted at the soundboard and mixed with a superb feed mixed by the band’s outstanding FOH Paul. The blend of the two sources produced perhaps the best of our many recordings of Luna to appear on this site. Enjoy! Early in October, we posted the Luna show from the first night of Rough Trade, which was part of a brief four-night tour from a month ago. All four nights of the tour were recorded, and this is the first show of the run at The Birchmere in Alexandria Virginia. I didn’t attend, but fortunately both Kubacheck and his friends from Sweden (Joakim and Ulrika) were there. It was Kuba with the recording and Joakim with an amazing tour diary that was just posted this week at the excellent fan site A Head Full Of Wishes. “They play Fire In Cairo. We’ve never seen them play it before, just heard the recordings, it’s nice to hear it for real. The Cure is band me and Ulrika has strong feelings for. Without Pictures of You and Lovesong we probably wouldn’t have been together. It was about 16 years ago, in a Stockholm suburb apartment, they where playing Disintegration at a party, and we danced, slowly, the night came to an end. She lent me Bewitched and Penthouse, it was nice. I met someone else, but a couple of years later we danced again. The same songs. Music has that affect on you. “Please get off the stage”, a speaker voice is saying after the show. We get the set list anyway. We step back out to the bar area and we meet Mike’s friends, Kathleen and Paul. Kathleen had made a t-shirt, with a print saying “I only dance to New Order”. It’s pure genius. I wish we could have spent much more time together. Everyone was overwhelmed by the show. Talking about how good it was. And the band looked very, very happy when they were outside in the lobby talking to all the fans. I saw Dean standing in the crowd of people and he looked at me, did a sign with his hands, keeping that satisfied smile on his face. He’s not always that comfortable after the shows, but this time he looked really relaxed. We talked with Sean for a while and Mike and Kathleen and Paul. There’s a lot more about this show and its all great, read the full diary entry [HERE]. Kuba recorded this set with his trusty MBHO rig and the sound quality is excellent. Enjoy! SUPPORT Luna: Website | Bandcamp | Long Players Box Set from Captured Tracks [HERE]. With their reunion currently in its third year, I think its safe to assume that Luna is back. 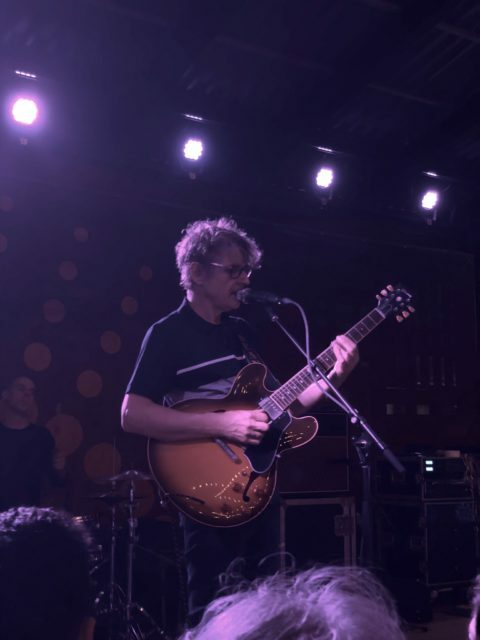 The band has been doing these brief and intermittent tours since 2014, and the current one (four dates) completed with two nights at Rough Trade in Brooklyn. The first night was a standard mixed set and the second night included a complete performance of the Penthouse album. The Saturday show began in earnest with 23 Minutes in Brussels, a lengthy song with a propelled instrumental segment that usually works as a show-stopping number. From the outset it was clear that this was going to be no ordinary night. There was classic numbers, obscure tracks, a song from Britta Philips‘ new solo album Luck or Magic, and ultimately two callbacks for encores. But what was most striking about this show was the band’s positive energy, tight arrangements and relative feeling of being at ease. They’re comfortable being Luna and that is a very good thing that bodes well for more tours and for our presence at local (and some distant) shows. I recorded this set with the Schoeps cards mounted inside of the soundboard booth and mixed with Evan’s superb feed. The sound quality is pretty much ideal. Enjoy! After their triumphant return in 2015, it remained to be seen whether Luna’s reunion was permanent. The band took some time off after their New Year’s show in California, but earlier this month Luna played the first of quite a few scheduled 2016 shows. The brief two-show run through Texas continued the band’s impressive return. For this particular Dallas show, the setlist contained the familiar songs, but also included a couple of rarities and of course the show featured some clever banter. The good news for NYC fans is that the band is back this coming weekend. Luna has sold out the Bell House this Friday night but our readers might be advised to try to find secondary market tickets. If that does not work out, Luna is returning to NYC for two shows in October at Rough Trade — and will perform Penthouse in its entirety. Luna’s bassist Britta Phillips released her first solo album Luck or Magic last month, and she is playing a free solo show (with a familiar backing band) at Rough Trade tomorrow (Thursday) night. Kubacheck recorded this Dallas show with his trusty MBHO rig and the sound quality is equally excellent to his previous contributions to this site. Enjoy! 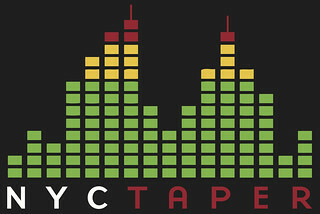 If you Download this recording from nyctaper, we expect that you will PLEASE SUPPORT Luna, visit their website, and purchase their official releases from the links at their website, from Bandcamp and the Long Players Box Set from Captured Tracks Records [HERE]. Last year was really the goldmine for Luna fans — a lengthy reunion tour with inventive setlists and universally strong playing. The band were happy to be back and it showed. We were pleased to have brought six recordings of Luna’s 2015 concerts to NYCTaper, four of them recorded by our friend Kubacheck. There have been a couple of nice developments in Luna land this month. Firstly, the band will be doing more concerts, this time a three-show run through Texas in May. We also found out that we’re likely going to be getting some recordings from those shows. Another excellent development is the upcoming release of Britta Phillips‘ first solo album Luck or Magic. The album is due to be released on April 29 and can be pre-ordered through Pledge Music. In celebration of these fine new developments, we’re posting a show also recorded by Kubacheck from this past Fall. This show at the classic 930 Club in Washington came on the heels of the Atlanta show where the band had performed the complete Penthouse album. This DC show is notable for the minimal amount of stage banter and for a real workman-like but very strong run through the best material from the tour. For a topper, Luna came back out a second time for an encore and delivered a bit of a rarity — a sharp cover of Donovan’s “Season of the Witch”. We’re hoping the shows upcoming in May will feature the same energy as the Fall tour, and I’m pretty confident they will. Kubacheck recorded this show in the same manner as the rest of his generous contribution to the site, with his MBHO cards in an advantageous front of board position. The sound quality is excellent. Enjoy! One of the nicer things about this superb Luna reunion tour has been the band’s acknowledgement of their own history. In Atlanta, Luna performed the entire Penthouse record from start to finish (recording here), and earlier in the week of New York shows, the Bowery Ballroom night was a chance to acknowledge the location of their final pre-reunion show in 2005 and the excellent documentary Tell Me Do You Miss Me of that tour (recording here). In Brooklyn, the band welcomed back the original drummer Stanley Demeski, the legendary percussionist from the Feelies who was the behind the kit for the first three Luna albums, including the aforementioned Penthouse. At this special night in Brooklyn, Demeski added a nice extra set of skins to three songs for which he played on the original recordings, including a particularly memorable “23 Minutes in Brussels”. The guest appearance was the highlight of one of the best played shows of the tour and what is also one of the longer sets of the reunion shows. Kubacheck recorded this show from a stand at the right nook in front of the soundboard booth with his excellent MBHO cards, and the sound quality is outstanding. Enjoy! 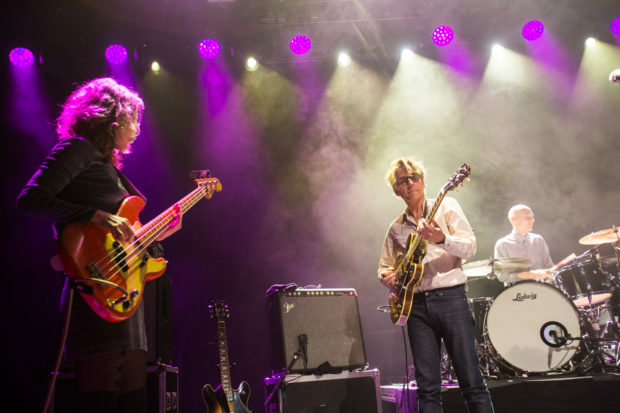 After a couple of successful mini-tours overseas (plus one Summer NYC show), it was time for Luna to tour the East coast in their highly successful reunion. The first show of this tour became one of the most memorable because the band chose this night to perform the complete album Penthouse start to finish. This release came at the pinnacle of Luna’s 1990s success, and it is perhaps their most consistently excellent album. Its certainly one of my personal favorites. Penthouse material has been prominent throughout the 2015 shows, so the performance of the complete record only added three songs that had not previously been played, and a couple that only made sparse setlist appearances. But it was all very tight, well played, and the band’s between-song banter continues to draw smiles. After the completion of Penthouse, Luna came out for a mini-set and an encore that stretched this concert longer than any previous in 2015. Luna’s current tour continues with seven more shows out West (dates here), including another performance of the Penthouse album at the Teragram Ballroom in LA presented by our friends over at Aquarium Drunkard. Kubacheck recorded this set from the front and center balcony of this venue — an excellent location sound-wise for capturing the show. Unfortunately, the crowd is boisterous and a bit chatty, but overall its an excellent recording. Enjoy! Ten years ago Luna retired with a series of shows at the Bowery Ballroom that eventually became part of the documentary Tell Me Do You Miss Me. In their return for two shows last week the band were well aware of the connection, but in their infinite jest used the reference as inspiration for their usual relaxed and often hilarious banter. When a band feels like they’re playing in front of friends, the show tends to be a celebratory affair and that was exactly feeling on this Wednesday night. In terms of the setlist, Luna pulled out a few numbers that haven’t seen much rotation this tour — “Fuzzy Wuzzy” and “Anesthesia” among them, the latter of which we are streaming below. Its going to be a good time for Luna fans here at NYCTaper. After this Bowery show, we’ll also have at least two more recordings. I recorded this set in our usual location at Bowery. The mix in the room was terrific and we supplemented that with a feed from the board that fortified the vocals. The result is a superb recording. Enjoy! We are extremely fortunate the Luna UK Tour in August has been so well documented. The first point of departure is the excellent fan site A Head Full of Wishes, which has compiled all the setlists, photos, video clips, and an extremely entertaining series of first person accounts of the tour. The stories contain multiple characters, including our own personal hero Kubacheck who taped this show and also the next night in Leeds (that we posted here). The HFOW post regarding this London show described the writer’s personal experiences and includes some recollections of the show itself. What’s not captured in the review — but is all over this recording — is the boisterous and animated crowd. Normally, this would be the bane of the taper’s existence, but for this night the crowd was entirely involved in the show and showed their great appreciation of the band. And for that, we can’t complain. The show itself was a rager from start to finish with a strong setlist similar to the recent shows. Among the numbers perhaps the lack of personal favorite “California” was offset by the inclusion of the not-always-played “Lost in Space”, but overall the existence of three encore songs tells us a lot about this excellent London night. The Luna shows in NYC in October are only three weeks away. We can’t wait. Kubacheck recorded this show in the same manner as the Leeds concert and the sound quality is equally superb, different only due to the specifics of the larger venue. Enjoy!